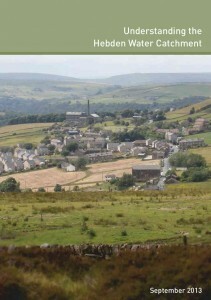 Treesponsibility have contributed toward the production of a booklet explaining all of the interweaving elements of land use and management affecting the function and ecosystem services delivered by the Hebden Water catchment.Please click on the image on the left to download a (free) copy. Ecosystem Services is the term that refers to all of those services, such as rainwater collection and the raw materials for food production that are provided by the land. As there are a whole array of ecosystem services operating within a catchment, it is important that the needs of the ecosystem are not forgotten and provided for through responsible land management for the benefit of all. This holistic approach is now considered the most sustainable way of viewing and managing the natural resources that keep us all alive.